Indeed, under pressure from China, World Bank President Jim Yong Kim commissioned a panel to "study"the Doing Business rankings and present recommendations for "improvement." Not surprisingly, the commission recommended doing away with the actual ordinal rankings, and switching to a less embarrassing evaluation of each country. Yes, the panel’s recommendations are nothing more than a thinly-veiled attempt to gut the Doing Business report. Stripping the ordinal rankings and "reforming" the report’s methodology would have the effect of completely destroying the report’s credibility and usefulness as a policy tool. Fortunately, the Doing Business report has one very important ally, Jim Yong Kim himself. A campaign to save there port has also been mounted by Doing Business report co founder, former World Bank Group Vice President Michael Klein. should be at the office of the Doing Business report staff. For an organization whose stated goal is the alleviation of poverty, it is important to have objective metrics by which to measure economic prosperity over time (and thus the alleviation of poverty). One common metric for measuring economic prosperity is per capita income. As the accompanying chart shows, prosperity also affects health (life expectancy) in a positive way. Yes, economic growth is, quite literally, a matter of lifeand death. That said, relying solely on per capita income as a measure of economic progress can be problematic. For starters, this metric can be skewed for certain countries by"outside" factors such as famine, civil war, discovery of natural resource deposits, etc. There is also a more basic question of the quality of the data being used to produce these economic statistics. As Prof. Morten Jerven illustrates in his recent book, PoorNumbers (Cornell University Press, 2013), economic statistics in Africa, for example, are often generated using incomplete data and faulty methodology — resulting in systematically flawed statistics in many countries. Similarly, as Prof. Oskar Morgenstern documented in his classic, On the Accuracy of Economic Observations, (Princeton University Press, 1950), the incompetence and willful trickery of many governments often render data, well, less than reliable. More recently, this "lying statistics" problem has been witnessed with official exchange-rate and inflation data in countries like Iran, Venezuela, and Argentina. Worse yet,some governments will simply stop reporting official data when they don’t like the results — see North Korea and Syria, as well as Zimbabwe circa 2008. The solution to this problem is to develop unbiased statistics, using objective data. As Prof. Peter Blair Henry,Dean of NYU’s Stern School of Business, notes in his new book Turnaround: Third World Lessons for First World Growth (Basic Books, 2013), stock market data can provide a useful tool for measuring the effectiveness of economic reform efforts. Blair also highlights the importance of relying on objective data, rather than ideology, to develop tailored economic reform packages for different countries. That said, objective data on macroeconomic growth must also be complemented with micro-level data on specific reforms. This is where the Doing Business report comes into play. 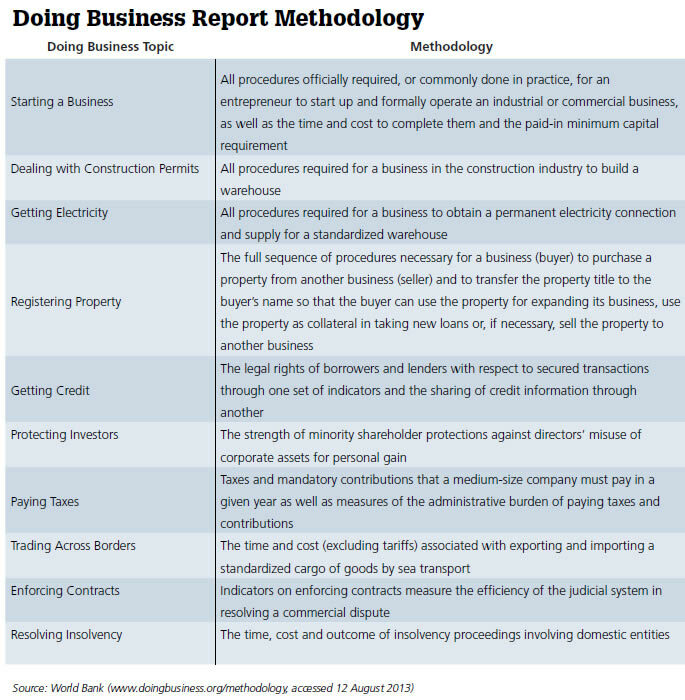 Rather than rely on often dubious official statistics, the Doing Business report uses data collected from over 9,000 accountants, lawyers, engineers, and other business professionals around the world. and medium-sized businesses — in short, the government-imposed regulatory costs of starting, running, and closing a business in a given economy. This also addresses the problem of data being skewed by outside factors like famine and civil war, since the Doing Business report looks at factors over which governments have a greater degree of control (see the accompanying table). As it turns out, a country’s Doing Business ranking can actually tell us a lot about a country’s health as well. 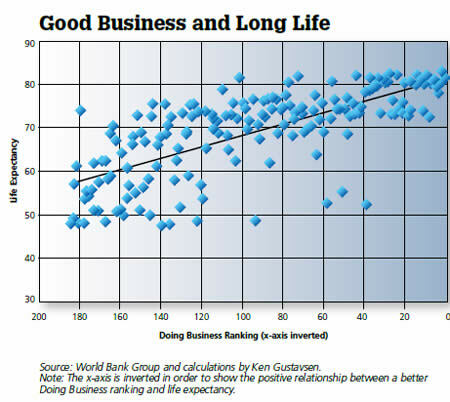 The accompanying chart from Ken Gustavsen, Executive Director of Merck & Co.’s Global Public Policy and and Corporate Responsibility Group, illustrates how countries with better Doing Business rankings also tend to have higher life expectancy rates. This chart looks familiar, doesn’t it? Recall the previous chart showing that that longer life expectancy and higher GNP per capita tend to go hand in hand. Now, a skeptic might claim that this simply results from richer countries being able to afford better healthcare. But, the Doing Business report doesn’t measure how rich a country is; it measures the costs imposed by government on businesses. So, what is going on here? In short, when governments embrace market-augmenting, business-friendly policies, the cost of doing business goes down, and economic prosperity tends to increase. Prosperity, in turn, leads to improvement in medical and public health factors that result in higher life expectancy rates. For a real-life example of this transformation, simply take a look at the country that has held the number one spot in the Doing Business rankings for the past two years running. That’s right, I am talking about Singapore. Singapore gained its independence in 1965, when it was, in effect, thrown out of Malaysia. At that time,Singapore was backward and poor — a barren speck on the map in a dangerous part of the world. Indeed, Singapore’s per-capita income in 1965, would be roughly equivalent to that of a country like Kosovo or Angola today, adjusted for inflation. Number one was stable money. Singapore started with board system — a simple, transparent, rule-driven monetary regime. Currency boards operate on autopilot,with automatic adjustments keeping the system in balance. Accordingly, currency boards deliver discipline to the spheres of money, banking, and fiscal affairs. For Singapore, a currency board provided stable prices and free convertibility at a fixed exchange rate, which attracted foreign investment. The second point was that Lee Kuan Yew ruled out passing the begging bowl. Singapore refused to accept foreign aid of any kind. This is a far cry from many developing countries, where, when you pick up the paper, all you see are politicians and bureaucrats trying to secure foreign aid from someone, be it an NGO, a foreign government, or an international financial institution like the World Bank. By contrast, "no foreign aid" signs hung, and still hang, figuratively outside every government office in Singapore. The third point was that Singapore strived to have first-world, competitive private enterprises. This was accomplished via light taxation and light regulation, coupled with completely open and free trade — in short, policies that enabled Singapore’s private businesses to become Asian tigers. The fourth point in the Singapore strategy was an emphasis on personal security, public order, and the protection of private property. These were the four goals of Lee Kuan Yew’s Singapore Strategy: stable money, no foreign aid, first-world competition, and law and order. Now, to accomplish these goals, the key to the strategy was a "small," transparent government — a minimalist government that avoided complexity and "red tape" — hence top ranking in the Doing Business report. To implement this principle, Singapore appoints only first-class civil servants and pays them only first-class wages. Today, for example, the Singapore an Finance Minister’s annual salary is over million dollars per year. In exchange for these high salaries, the Singapore Strategy demands that the government run a tight ship, with no waste or corruption. By embracing Lee Kuan Yew’s Singapore Strategy of stable money, no foreign aid, first-world competition, and law and order; and by demanding a government that is absolutely free of waste and corruption, Singapore has transformed itself from a poor, barren speck to a global financial center. Indeed, a recent survey ranking the world’s top five financial centers put Singapore as number one — ahead of Switzerland, Hong Kong, London and New York. In Singapore, the market is the guiding principle of the economy, just as Lee Kuan Yew’s 1965 manifesto provides the guiding principles for Singapore’s government. Indeed, the key to understanding the Singapore Strategy is to realize that it is a strategy in which the Singapore an government is mandated to produce market-augmenting policies that encourage economic growth. It should thus come as no surprise that Singapore today is one of the freest, most flexible, and prosperous economies in the world, as reflected by its number one Doing Business ranking. And, lo and behold, Singapore ranks in the top ten with regard to health outcomes — well ahead of large developed countries like the United States. As Prof. William A. Haseltine noted in his recent book, Affordable Excellence: The Singapore Healthcare System (Brookings Institution, 2013), Singapore achieved dramatic, cost-effective healthcare results by embracing efficiency and fostering competition between private healthcare providers and the government. Indeed, when it came to health care, Lee Kuan Yew once again ruled out passing the begging bowland instead insisted on personal responsibility, via fee-based service and personal health savings accounts, among other innovative solutions. While the Singaporean government does play a central role in the country’s healthcare market, the key take away is that Singapore’s health system is one characterized by simplicity and transparency — resembling neither the massive public monopolies of Europe, nor the complex regulatory nightmare of the U.S. system. If developing countries were to embrace the Singapore Strategy, they too would climb the Doing Business rankings very rapidly. Corruption and poverty would decrease, income and growth would increase, and, I suspect, health out comes might just improve, as well. At the end of the day, the key to implementing meaningful economic reform is objective data by which countries can measure their progress. So long as Jim Yong Kim holds fast and preserves the Doing Business report, as is, countries will continue to be able to make strides and measure their progress. The Doing Business report not only provides a framework for economic reform; it also serves as a challenge to implement it around the world. If countries like China are embarrassed by a poor Doing Business ranking, they should leave Jim Yong Kim alone, and give Lee Kuan Yew a call. This article appeared in the September 2013 issue of Globe Asia.